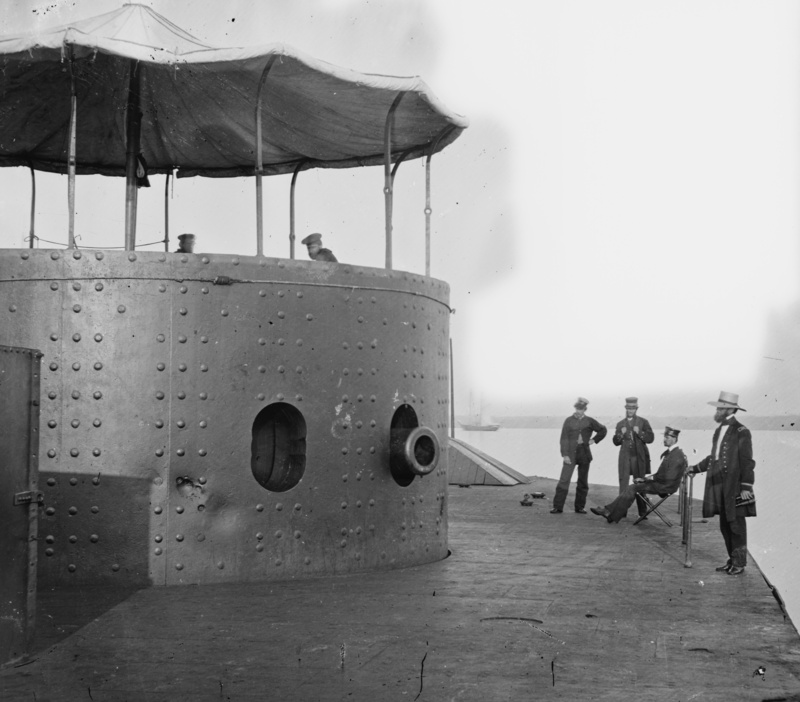 The steamer USS Monitor was launched on January 30, 1862, during the American Civil War and was the first ironclad ship commissioned by the U.S. Navy. On March 9, 1862, iron met iron when the Monitor fought the Confederate ironclad CSS Virginia during the Battle of Hampton Roads. Although the battle was considered a draw, it signaled the end of wooden warships, changing naval warfare forever. Nine months after the famous battle, the ship succumbed to a storm off the coast of Cape Hatteras, North Carolina. Between 1998 and 2002, more than 210 tons of artifacts were recovered from the wreck site by U.S. Navy divers and archaeologists from the Monitor National Marine Sanctuary, National Oceanic and Atmospheric Administration. Objects recovered included components of the propulsion system and a significant portion of the engine room section of the ship, culminating with the raising of its iconic 120 ton revolving gun turret. Once recovered, the artifacts were transferred for conservation, curation and display to The Mariners’ Museum and Park in Newport News, Virginia. The Museum serves as the officially designated private partner repository for USS Monitor artifacts since 1987. Conservators at the Museum work to stabilize the artifacts, which have degraded after almost 140 years of immersion in seawater. The conservation process can take years or even decades to complete. The Museum is dedicated to preserving these historical pieces so that they can be used to tell the stories of the ship and crew for generations to come. 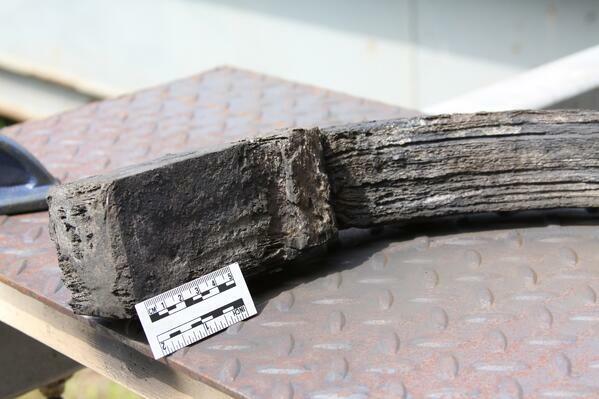 The conservation treatment of large wrought iron objects recovered from the wreck site of USS Monitor has proven quite challenging due to the sheer size of many of the artifacts such as the ironclad’s revolving turret. Standard methods to remove deep pockets of embedded corrosion using hand tools have been found to be impractical due to the amount of time and labor required. “Traditionally, corrosion is removed using an assortment of small hand and pneumatic tools, and that's fine with small objects,” said Will Hoffman, Conservation Project Manager. “But you just can't do it when you're talking about something as large as the Monitor's turret. It's nine feet-tall and twenty-one feet across." Typical media blasting systems produce abrasive residues which could pose a health risk to staff, have the potential to clog expensive plumbing equipment and, ultimately, must be collected and disposed of properly. Conservation staff began looking for a corrosion removal technique that was effective in a relatively short period of time, safe for staff and left behind minimal by-product. Dry ice blasting was explored to fit the required criteria. The Museum became familiar with Cold Jet’s dry ice cleaning process and thought it might be the perfect solution. Dry ice blasting is an air-powered media blasting system which uses solid carbon dioxide (CO2) in place of walnut shells or other particulate material. Unlike the other blasting techniques, dry ice sublimates (converts from solid to gas) upon impact with the surface being cleaned, leaving no residue behind other than what was removed from the cleaning process. 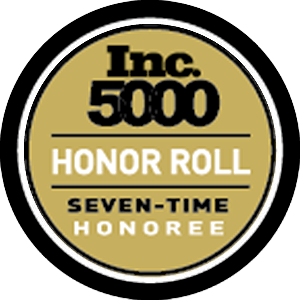 This results in a cleaning technique that is safe and non-toxic, does not create downstream contamination and reduces or eliminates exposure to dangerous chemical cleaning agents. To determine if the technique could be applied to the removal of corrosion from archaeological wrought iron, conservators borrowed an SDI Select 60 machine from Cold Jet and tested the process for more than two years. 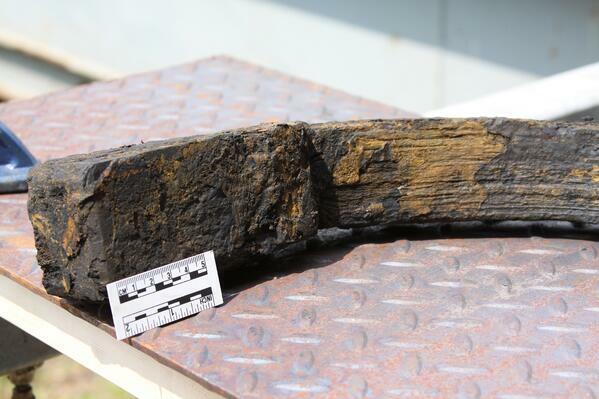 The goal of the research was to see if the cleaning method could successfully remove surface corrosion without damaging the surviving metal substrate below. They began testing on various wrought iron components of the vessel to identify safe cleaning parameters through a combination of varying air pressures, ice volumes and blasting distance. Once tentative working parameters were established, microscopic analysis was carried out on sample material with photographs (taken before and after cleaning tests were performed) to identify if changes to the surfaces of the samples had occurred. The results of the work showed little change had occurred. "Even when the surface was magnified 350 times, we didn't see any pitting,” said Hoffman. “We didn't see any signs of abrasion. We didn't see any damage." Based on the positive testing results, the Museum was able to successfully apply for a Maritime Heritage Grant, administered by the National Park Service, to acquire all necessary equipment. Since spring 2016, dry ice blasting has been regularly employed within the conservation laboratory, thereby shortening cleaning times dramatically. 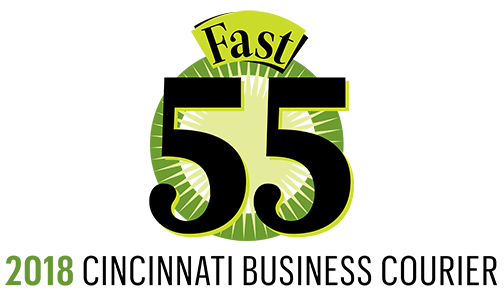 Recently, using the Cold Jet SDI Select 60 with a 312S1 nozzle, conservators used four pounds of shaved dry ice particles per minute to clean corrosion off of a 4- by 8-foot structural bulkhead plate in a little more than an hour. This would have taken two to three weeks of intensive cleaning if done by hand. 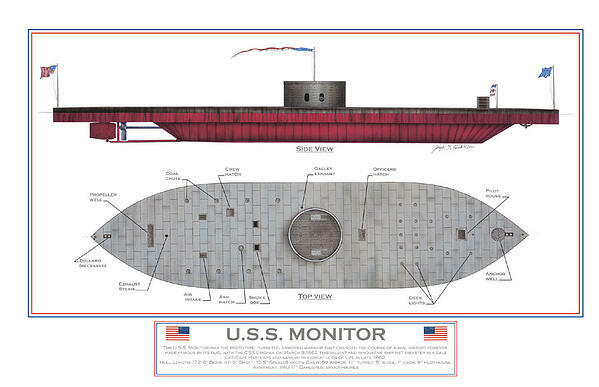 "When you add it all up, it's really going to help us get these objects out on display quicker to help tell the stories of USS Monitor,” said Hoffman. *Images are courtesy of The Mariners’ Museum and Park and the National Oceanic and Atmospheric Administration. 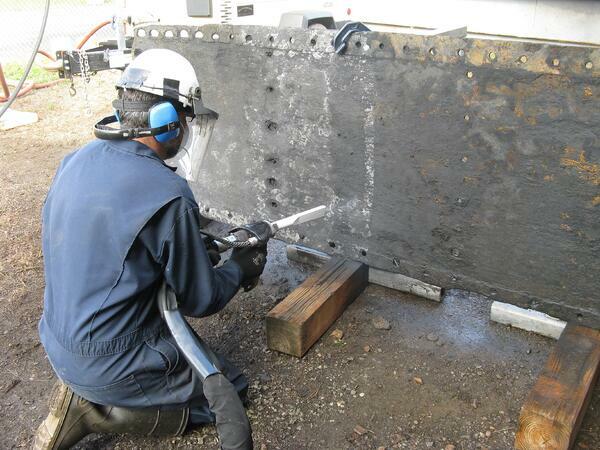 Conservation staff utilized non-abrasive dry ice cleaning to remove corrosion from the USS Monitor's turret in a fraction of the time that it would have taken with hand and pneumatic tools. No pitting, abrasion or damage was caused to the wrought iron surface.